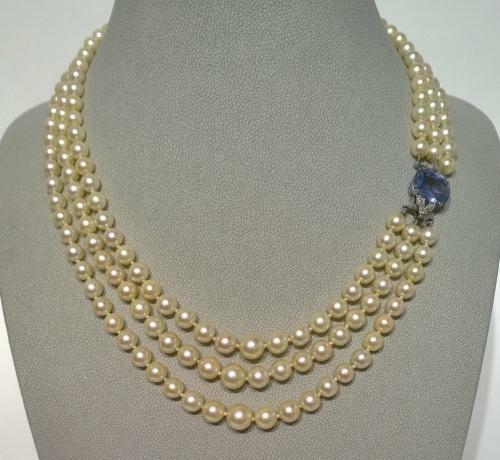 A cultured pearl graduated three row necklace with a large sapphire set to the clasp. The pearls graduating from 5mm up to 8.5mm of good quality and very well matched. The sapphire is 14mm by 11.5mm, approx 7.5 - 8 cts in weight. A beautiful, clear blue colour of Ceylon origin, most likely not heat treated. 18ct white gold claw setting with supporting diamonds. An elegant and original 1950's piece.